My apartment is on the edge of what they call “The City”, which is short for The City of London. Nowadays it’s the financial center of London, full of shiny modern skyscrapers (which may or may not look like pickles and/or walkie talkies), but back in the day this was it — THE city of London that goes all the way back to the fortified town the Romans built in 200 A.D.
There’s an official London Wall Walk that essentially consists of series of panels that mark where the old city walls used to stand (or even in some cases still do stand). 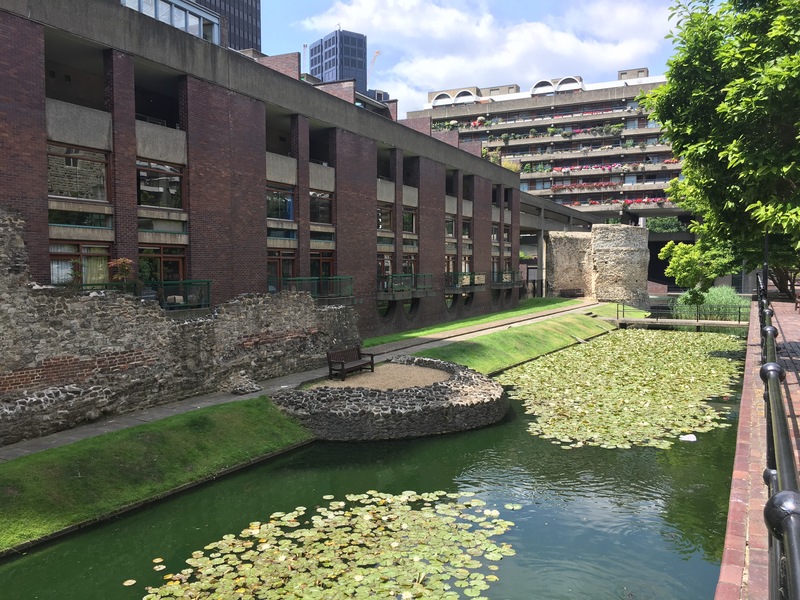 They start at the Tower of London (built in the 1060s after the Norman Conquest) and curve up and around to a complex called the Barbican, which stands on the site of the Roman fort. Finally you end up at the Museum of London. 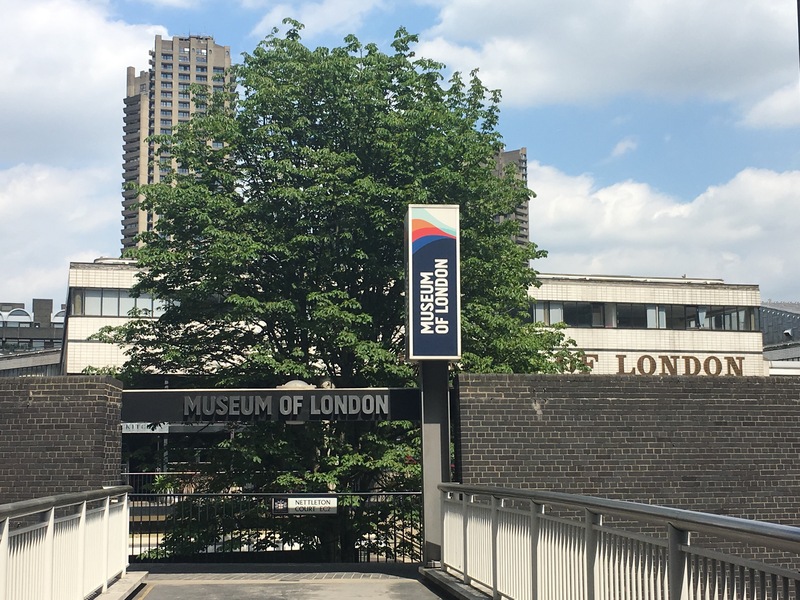 The drab and somewhat grimy-looking building vastly undersold the quality of the exhibits — for a free museum on a hot Saturday, I thought it was pretty good. 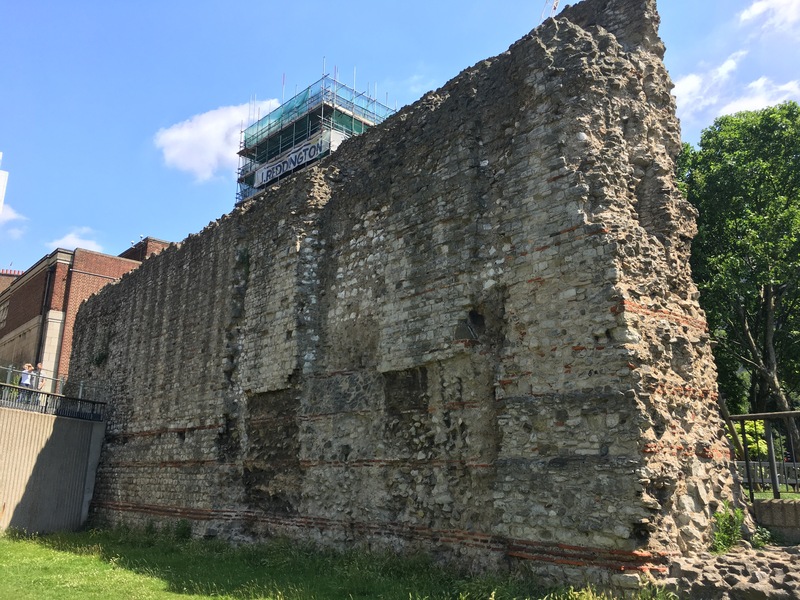 The museum walks you through the history of the city, from the Romans to the Middle Ages to the Black Death and the Great Fire. It weirdly skips WWII (I assume they’ve got other, better museums for that) and wraps up in the 2000s with the Olympic Cauldron. 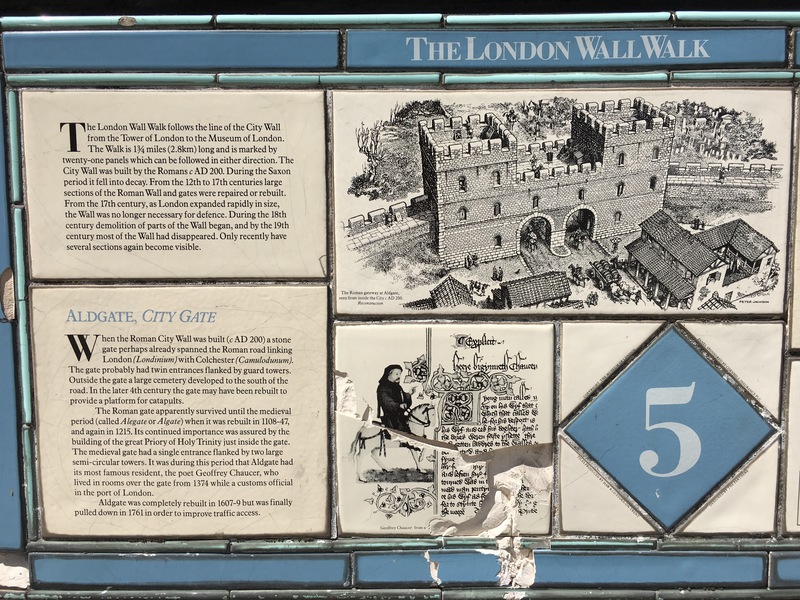 Depictions of the wall at various stages. The pieces that survive today are largely thanks to having been incorporated into other buildings over the centuries. The bottom two-thirds is Roman, the top third was added in the Middle Ages. It’s hard to tell from this photo, but the Roman stone work is much higher quality than the medieval stone work. This is the sign that’s right next to where I live. 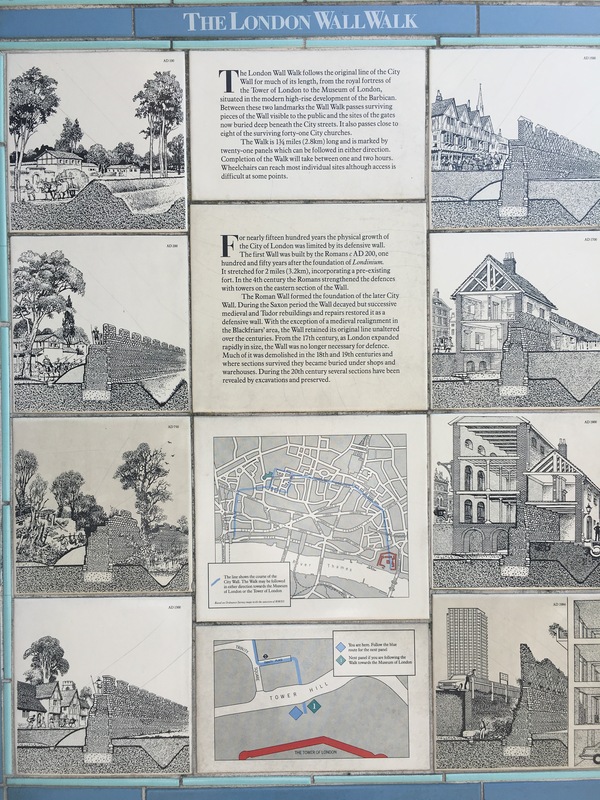 I like that I live where Chaucer lived! This building is tucked away amidst some very large and non-descript office buildings. 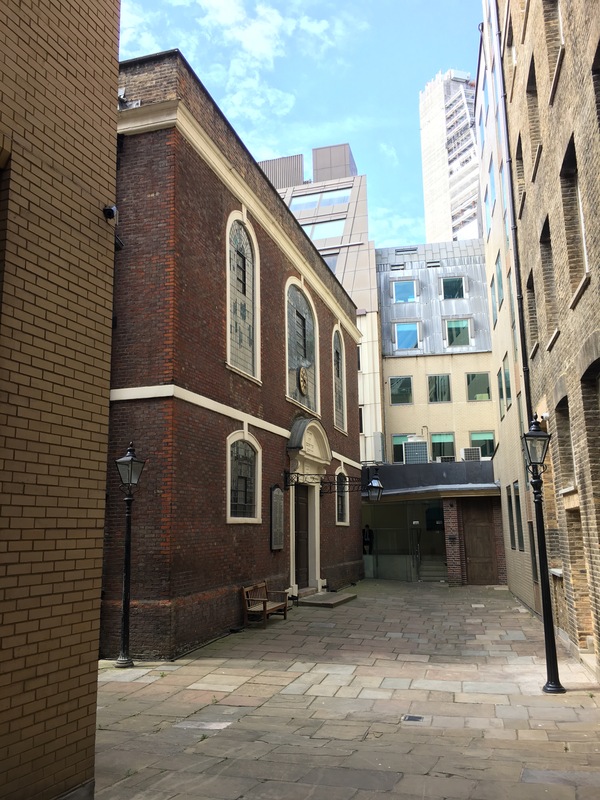 It’s the oldest synagogue in England. 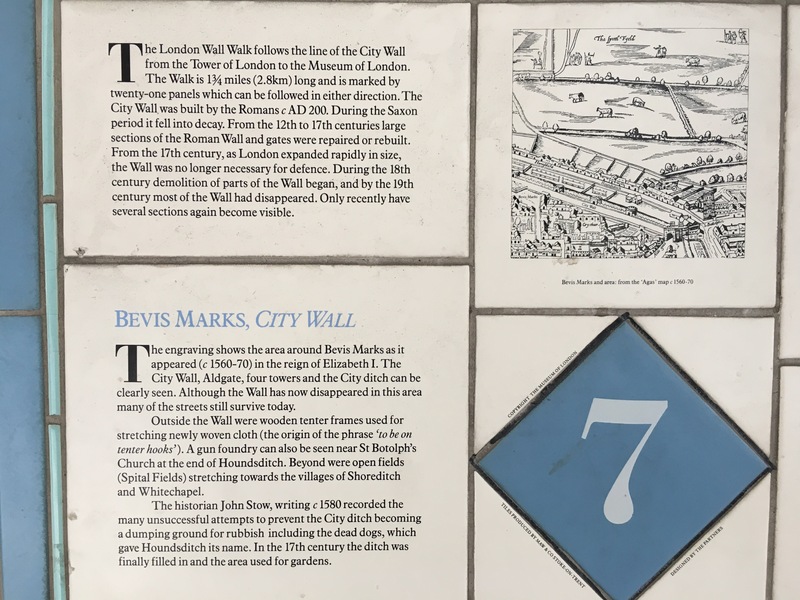 This is my favorite thing about the wall walk panels — they show maps from the Elizabethan era for the areas that I walk through every day. 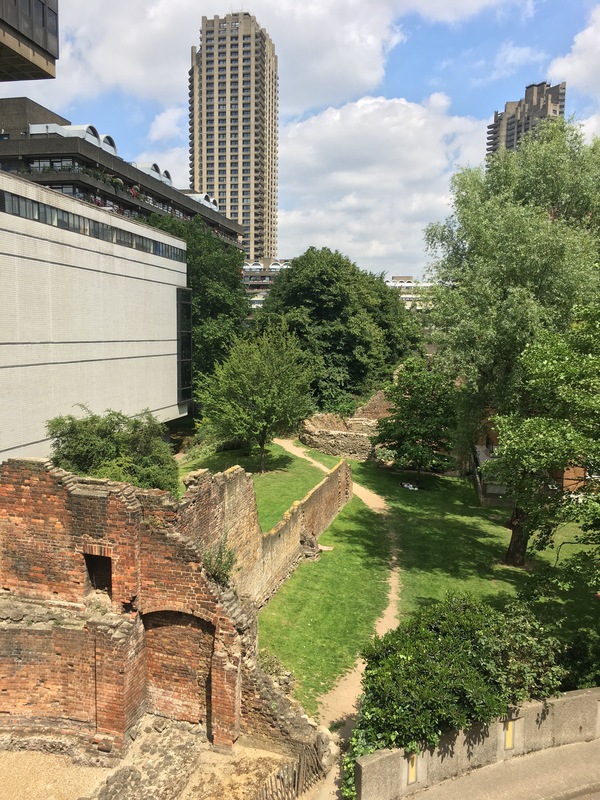 Also, you learn interesting things — for example, the modern Houndsditch Street (where my gym is located) is built on the old city ditch that ran just outside the old city wall (pictured above). It got its name from being a ditch where people would dump dead dogs! 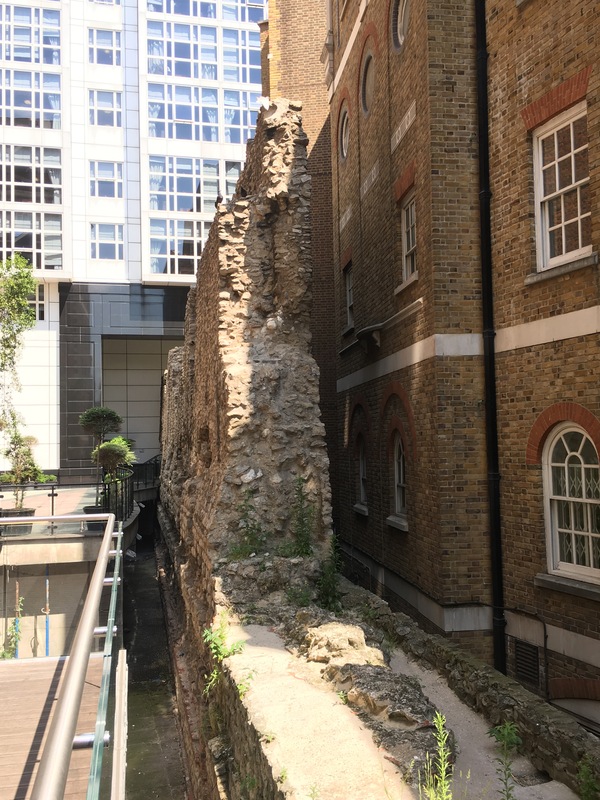 This is one of the portions of the wall inside the Barbican complex. The pond is where the old defensive ditch would have been. 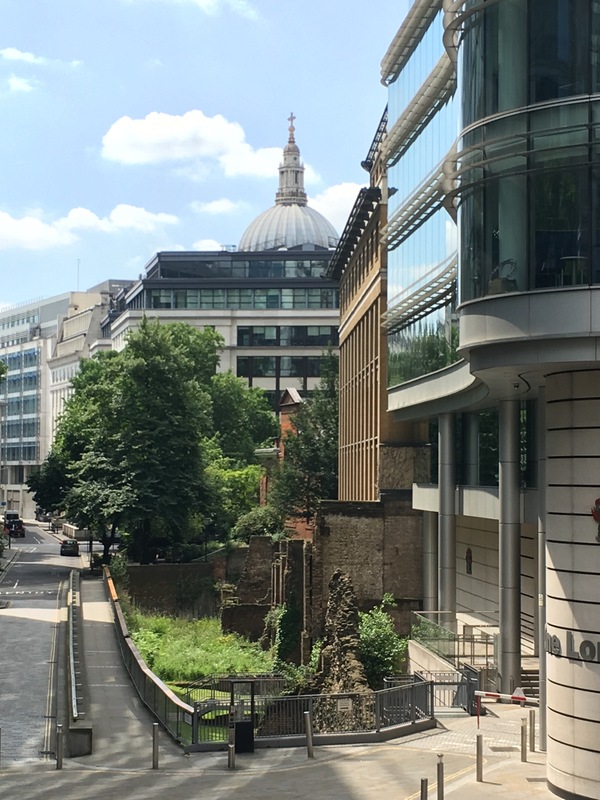 That’s the dome of St. Paul’s Cathedral peeking out above the buildings. 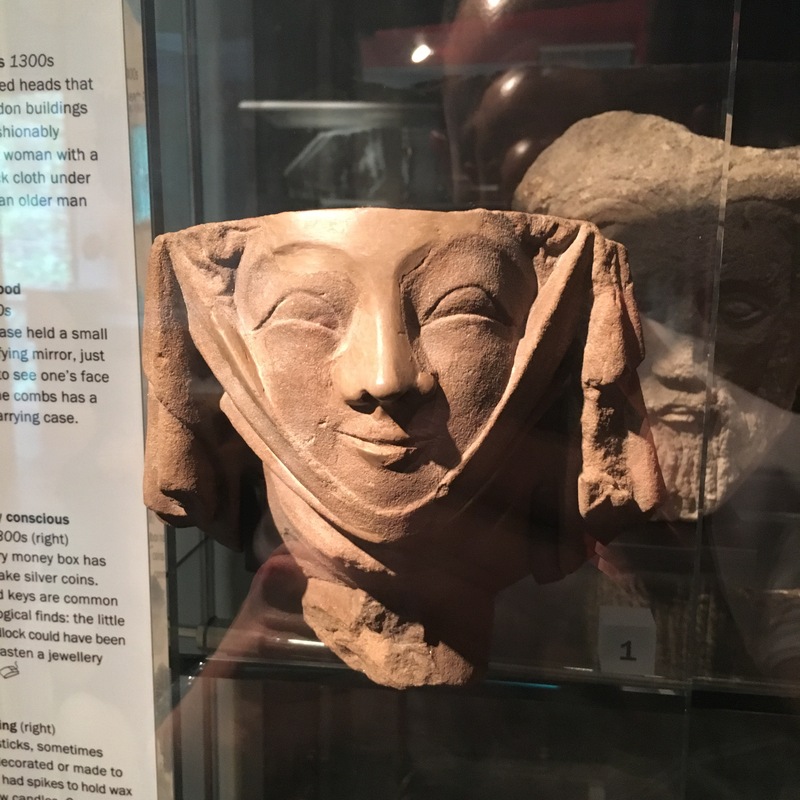 A happy face from the Middle Ages. That cloth under the chin is a wimple. 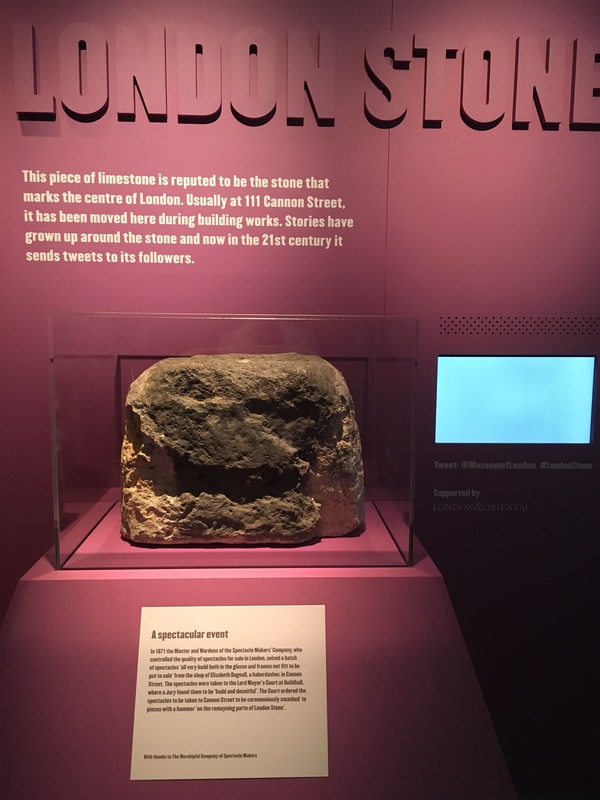 I really love that the stone that marks the center of London is on Twitter.